Supplying Quality Electronic, Electrical and OEM Components for Over 39 Years! Binding Posts & Banana Sockets NEW PRODUCT! Solder Irons/De-Soldering Tools NEW TYPES! 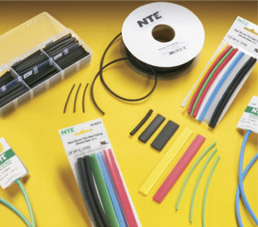 Select the proper size of heat shrink tubing for your project. In order to get a secure fit, be sure that the tubing’s recovered diameter (the diameter after shrinking) is smaller than the diameter of the area you’re going to insulate. At the same time, the tubing’s expanded (the diameter before shrinking) needs to be large enough to easily fit over the area to be insulated, as well as any connectors attached to it. Cut the heat shrink tubing to a usable length, and be sure to allow for a minimum 1/4” overlap over any existing insulation or connectors. Keep in mind that tubing also shrinks lengthwise - typically 5-7% during the shrinking process. If covering an object, slide the cut tubing over the object that you’re covering; if splicing, slide the tubing over the splice, centering it to allow for equal overlap on both sides. Before shrinking, check your tubing's specifications for the recommended heating temperature. Any commercial heat gun or heat shrink oven can be used to shrink the tubing. NTE has some great options available in our Heat Guns section. Since uncontrolled heat can cause uneven shrinkage, physical damage and insulation failure, the use of an open flame is really an emergency resort. If you’re covering a long length of cable with tubing, begin shrinking at one end, and gradually work your way down to the other. To ensure that the tubing shrinks evenly and without air bubbles, rotate the project as you’re applying heat. Evenly apply heat over the length, and around the diameter of the tubing, until fit is uniformly shrunken and conforms to the shape of the cable, hose, or splice that it’s covering. Avoid overheating the tubing as it will become brittle and/or charred. 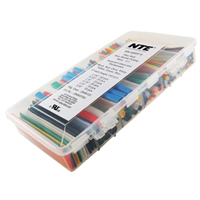 This brochure from NTE Electronics contains information on our Heat Shrink Tubing in a convenient 4-page format. Click here to view/download this document. © NTE Electronics, Inc. 2019. All rights reserved. WARNING: Some products on this site can expose you to chemicals, including DEHP, which is known to the state of California to cause cancer and birth defects or other reproductive harm. Please consult NTE for additional information.